1) This paper was presented at the FIG Working Week in Sofia, Bulgaria, 17-21 May 2015. The paper elaborates on the use of of photogrammetric methods in the creation of a cadastre map. The paper is based on a field study from Bulgaria. On 25.04.2000 the Cadastre and the Property Register Act (CPRA) was promulgated in the State Gazette. This provided for the commencement of the workmanship of cadastre maps and cadastre registers (CMCR) of the populated areas in Bulgaria. Subsequently this Act was amended and supplemented exactly 20 times and the most essential amendment was adopted in 2014. Topographic and cadastre plans were elaborated up to year 2000, which the entire graphic information about the populated area was collected in – buildings, fencings, infrastructure, overground elements of the underground infrastructure, relief and so on. I.e. as a result, we had full graphic information about the populated area. The matter with the cadastre registers was different. A “registry sheet” was applied with regard to the cadastre plans, which in the general event solely names of owners were filled up in, and in most events the legal grounds for the possesion of the property were not reflected. In fact the existing cadastre plans were divided into two kinds of different maps with the entry of the Cadastre and the Property Register Act. The methods for the creation of a cadastre map are various and the most appropriate and secure method is through direct geodetic measurements. Can photogrammetric methods help in the elaboration of a cadastre map? This is the question which this presentation shall seek an answer to. На 25.04.2000 г. в Държавен весник е обнародван Закон за кадастъра и имотния регистър. Това даде началото на изработването на кадастрални карти и кадастрални регистри на населените места в България. В последствие, този закон е изменян и допълван точно 20 пъти, като най-същественото изменение е прието 2014 г.
До 2000-та година се изработваха топграфски и кадастрални планове, в които беше събрана цялата графична информация за населеното място – сгради, огради, инфраструктура, наземни елементи на подземната инфраструктура, релеф и др. Т.е. като резултат, разполагахме с пълна графична информация за населеното място. Не така стоеше въпросът с кадастралните регистри. Към кадастралните планове се прилагаше „разписен списък”, в който , в общият случай се попълваха само имена на собственици, като в повечето случаи не се отразяваше провното основание за владеенето на имота. Различни са методите за създаване на кадастрална карта, като най-подходящият и сигурен метод е чрез директни геодезически измервания. Може ли фотограметричните методи да помогнат при изработването на кадастрална карта ? Това е въпросът на който ще стърси отговор настоящата презентация. In this presentation we shall consider the technical part at the creation of the cadastre maps without going into depth with regard to the manners and the methods of creation of cadastre registers. The activities for the creation of cadastre maps and registers are implemented by persons who acquired qualifications under the virtue of the Cadastre and the Property Register Act or who acquired qualifications in accordance with the procedure of a member-state of the European Union. An independent site in a building or in facility of the technical infrastructure. 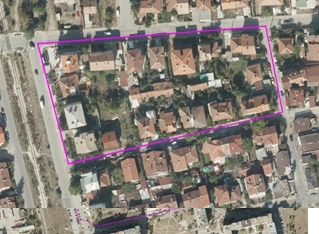 The land property is the main unit of the cadastre. The land property is a part of the land surface, inclusive of the one which is permanently covered with water, defined with limits in conformity with the right of ownership. These definitions indicate that the creation of the cadastre map does not consist solely of survey of the fencings and buildings existing on the spot. This is a significant stage of the work but there is subsequent treatment which requires knowledge of all the laws and subordinate legislation related to the ownership of real estate properties. We will consider herein the procedure for the creation of a cadastre map in brief. All the graphic materials should be scanned, geo-referred and digitalized at the judgment of the Contractor. After the laying and the calculation of a Working Geodetic Base (WGB) overall survey of the existing buildings and fencings will be made. This stage is of exceptional significance due to the fact that these are the real limits within which the land properties are possessed. On the basis of the fencings surveyed on the spot, the digitalized plans and what is of the greatest significance – the documents for ownership, the real property limits are generated. The experience of the qualified person is of essential signifcance at the generation of the property limits. He should judge the degree to which the existing fencing coincides with the property limit. Inquiry of the owners will be made in parallel with these technical activities so that the information about the ownership obtained from the registry sheets and the correspondences from the municipal administration should be filled up and updated. Creation of a cadastre map with the help of photogrammetric methods. It is not by chance that we said “with the help of photogrammetric methods” in the title of this part of the presentation. We are of the opinion that the photogrammetric methods may help a lot for the needs of the cadastre map, but they may not be used without surveying the territory in conformity with the standard geodetic methods – a lawn photo with total stations and/or GPS measurements. The matter related to the creation of 3d cadastre and specilaized maps for structural planning is different and we will consider this matter herein below. We made an attempt at creating a cadastre map in conformity with a photogrammetric method for a small territory of the District of Poduyane. 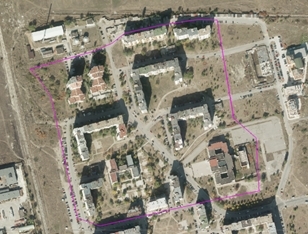 For the purpose we used air surveying made at the order of Company GIS – Sofia EOOD (LTD) in 2011. The survey was made by camera UltraCam XP at the height of 2200 m, with pixel 0.10 m, focus distance 100.5 mm. We will not consider the details of the aerotriangulation in detail here. The photogrammetric processing was made by a photogrammetric station with software product PHOTOMOD. We defined 2 districts – one of them by a complex residеntial construction (Fig. 1) with an area of about 11 hectares and the other one with individual construction (Fig. 2) with an area of about 1 hectare. 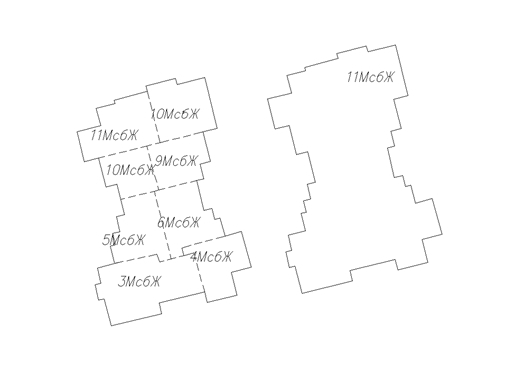 After the receipt of the stereo model of the site we made mapping of the elements, subject-matter of the cadastre map, which may be mapped – buildings (in the base) and fencings. In fact there was possibility to determine the coordinates of the tops of the buildings and the fencings solely for about 5-10 % of all the buildings and fencings. We did not make use of the possibility for mapping roof lines and measurement on the spot of the eaves due to the reason that for us this method for determination of coordinates of detailed points with precision satisfying the requirements of Ordinance 3 is inapplicable. Another reason not to use the field decipherment as a method for supplementing the photogrammetric data for the purposes of the cadastre map is that the work for the decipherment is not smaller than that at the conventional geodetic methods. In this manner, the price of the end product will be considerably increased, without resulting in the reduction of terms or a better result. In 2014 we also made full survey of the same territory with total stations and we used a working geodetic base as its basis, with development of the needs of the cadastre map of the District of Poduyane (Fig. 3 and 4). The survey was made by 2 field teams for 3 working days. If we add to this term also the term for laying and leveling a working geodetic base, the total time for full survey of this territory does not exceed 5 working days. 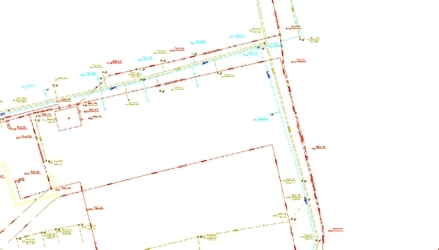 It should be noted that further to the survey of the existing building fund and the building fencings, other elements of the existing infrastructure – curbs, roads and so on – should be surveyed at the workmanship of the cadastre map as well. For all these elements of the city infrastructure, the photogrammetric methods allow for fast and of quality obtaining the needed information with the necessary precision. We used a photogrammetric method (Fig. 5). The mapping of these elements was made by the stereo model and not by an orthophotomap. 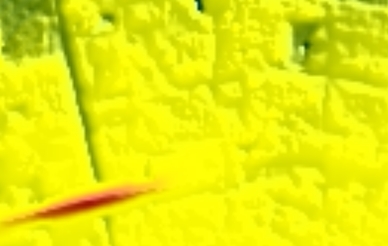 It is important to note that down, as the error obtained at the use from an orthophotomap from the imprecision of the relief drops out at mapping by a stereo model and all the reported points are with their altitudes above the sea level. The mapping took about 20 minutes of one specialist which is incomparable with the time needed for field survey. We performed survey in conformity with the standard geodetic method for verification of the results obtained. After a comparison made of the results obtained in accordance with the two methods, the differences even in one case do not exceed the admissible values pursuant to Art. 18 of Ordinance 3. In the long run we obtained a complete digital model of the investigated territory with the needed precision. Up to here we considered the use of photogrammetry in the process of initial collection of data from measurements for the creation of a cadaste map. After the completion of the field survey, control is exercised over the work done. The photogrammetric methods are irreplaceable here in this process as well. A precise assessment and an analysis of the ready-made cadastre map may be made on the grounds of a developed orthophotomap of the territory. I.e. with the help of the photogrammetric methods it is possible to accelerate the process for the creation of a cadastre map, but this will be at the expense of considerable increase of the expenditures. It is due to this reason that photogrammetric survey with Unmanned Aerial Vehicles (UAV) may be considered for the acceleration of the process in regions where we have complex construction of a comparatively big area as the district indicated in Fig. 1 is. For these regions the survey of the existing infrastructure with the help of Unmanned Aerial Vehicles (UAV) will considerably accelerate the process without exerting essential impact over the price. The use of standard photogrammetric survey solely for the purposes of the cadastre map is not expedient because of making the process considerably more expensive. The use of Unmanned Aerial Vehicles (UAV) for survey of the existing infrastructure and control over small terirtories with complex construction is very useful for the needs of the cadastre map. We would like to offer to your kind attention a realized method for the creation of a three-dimensional model of the cadastre map. The method offered by us does not create a precise three-dimensional model with regard to the roofs of the buildings from the cadastre map but allows the creation of such a model for very brief time and provides an overall idea of the territory. When the matter is about big territories, the photogrammetric method is the most appropriate one for the creation of a digital model of the terrain (Fig. 7). 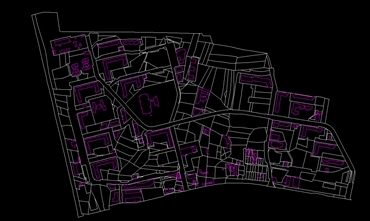 We initially use the contours of the buildings and of the properties from the data obtained from the cadastre map (Fig. 8). After we impose this information onto the terrain, we may obtain a three-dimensional model of the property limits and of the foundations of the buildings (Fig. 9). 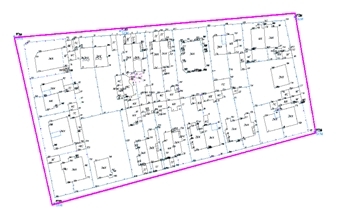 A specialized format is created in Bulgaria - *.CAD for exchange of data from a digital cadastre map. We will not consider this format in detail, we will only note down that it preserves information about limits of properties, contours of buildings, as well as a number of floors, structure of the buildings and so on. The files in format CAD are text ones, which allows the very easy extraction of information needed with developed applied software. We may comparatively easily obtain the height of each building on the grounds of the data received from the cadastre map about the number of the floors of the buildings and on the grounds of the three-dimensional model of the contours of the buildings. 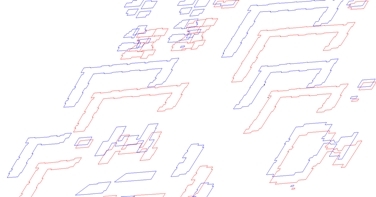 In this manner we obtain two three-dimensional contours – one on the ground and the other one at the height of the building above the ground (Fig.10). Naturally the question how to determine the height of a building arises here. For the purposes of the three-dimensional model of the populated area, we consider that it is sufficient to set up a medium height of the floor and in this manner to obtain the heights of the buildings. Our system allows us to change the heights of the floors for specific buildings. 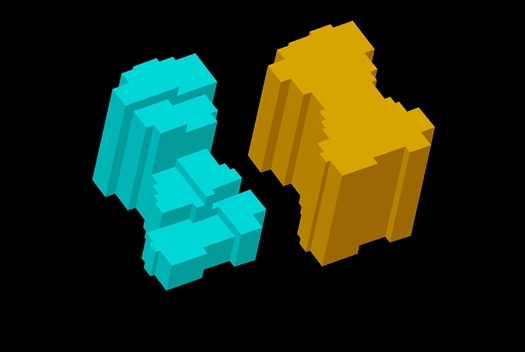 The following step is to obtain a three-dimensional model of all the buildings. 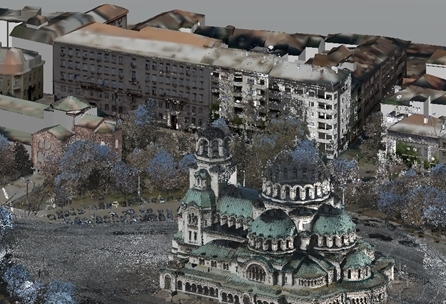 We may do this again with the help of the photogrammetric software Photomod with the function 3d-mod (Fig. 11). It is possible to export all thus obtained information in an arbitrary format and to use it with other software packages (Fig.12). In conformity with this technology, with available initial data we may create a three-dimensional spatial model of a very big territory within the framework of half a day. What were the problems we encountered. In fact the main problem is the information contained in the *.CAD format. When a building is with various heights, the information preserved about this building is only about the highest floor. A building is shown in Fig. 13 at survey and after its reflection in the cadastre map. As at this time the information system of the cadastre does not provide precise presentation of a building in conformity with the changes of its height. This information may be obtained only after the investigation of the schemes of independent sites in the building if any. In Fig. 14 we indicated how the same building would look at reporting the differences in height and without rendering an account of these differences. It is seen that with the absence of the differences in height, a completely erroneous idea of this building is obtained. 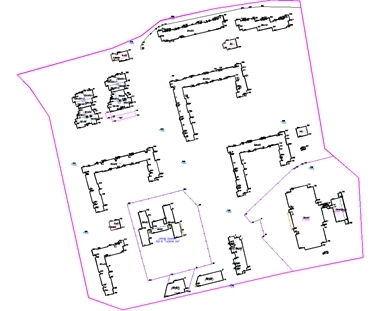 With this example we want to indicate the exceptional significance of the correct and precise cadastre information. Perhaps it is appropriate that the competent institutions in the face of the Geodesy, Cartography and Cadastre Agency should consider the supplementing of the now existing format for exchange of information although there is a cadastre map for almost all the big towns of Bulgaria and we are of the opinion that the time for that has already passed. Company Geocad 93 EOOD (LTD) also developed a variant for the creation of a three-dimensional model of the cadastre map in conformity with another technology which, however, is much more labor-consuming but at the expense of this it provides complete and precise results. We will also consider this technology in brief. The cadastre map, the digital model of the terrain and the digital model of the roofs of thee buildings are the initial data about this technology. Mapping of the roofs of the buildings as well as of the eaves is required. In fact with this technology we obtain information about the heights of the buildings not from the data from the cadastre map but from the mapped roofs of the buildings. With this technology we again obtain a three-dimensional model of the foundations of the buildings in the manner already indicated herein. We used the software Bentley MAP Enterprise for the processing of the information thus obtained from the digital model of the terrain, the three-dimensional models of the foundations of the building and the three-dimensionally mapped roofs and eaves. Modeling of the façades of the buildings is performed, and each façade is obtained from the three-dimensional foundation of the building up to the level of the eaves. As a result of this we obtain a real and precise three-dimensional model of the populated area. 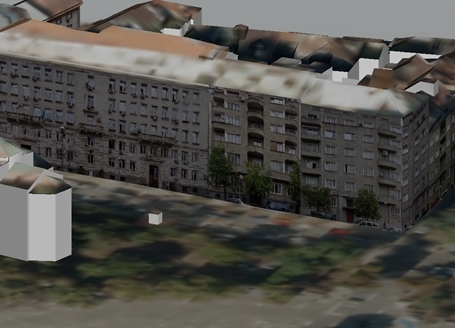 This model may be supplemented with textures, and the textures of the roofs are obtained from the orthophotomap and those of the façades from their photographic survey (Fig.15). Thus we will obtain further to a completely correct, also a realistic model of the populated area. This model may be supplemented by information obtained from alternative methods of surveying. 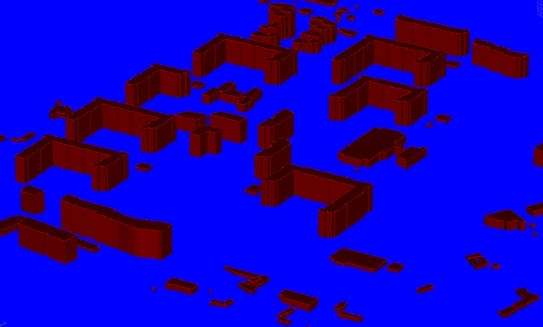 The supplementing of the obtained three-dimensional model with data from laser scanning is indicated in Fig. 16. In the long run in this manner we obtain a completely correct three-dimensional digital model of the populated area, but at the price of incomparably more time and funds. We will provide the examples for the use of the three-dimensional model of the populated area making use of the data obtained from the first technology we presented. In the first place, this is the application of the three-dimensional model in the urbanization design. A multitude of software products which allow work with three-dimensional models have already been developed and are offered on the market. It is indicated in Fig. 17 how an idea of the manner in which a district would look with new construction in conformity with an approved urbanization plan could be acquired. 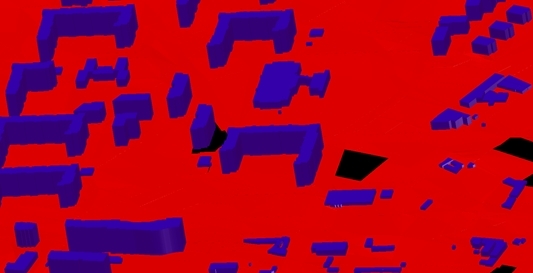 The design positions of new buildings are indicated in red color. As it may be supposed with this technology for creation of three-dimensional models of the populated areas that the distances between the existing buildings are fully precise, within the limits of the precision of the cadastre map, the obtained urbanization design will completely correspond to the existing situation and all the needed data may be obtained from this model. 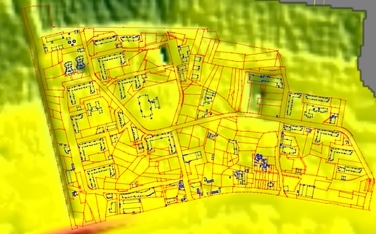 Another very important application of the three-dimensional model of the populated area is the possibility for its being supplemented with data about the underground communications with the existing new technologies for localization and survey of the underground communications and from the information which is contained in the plans of the underground conduits and facilities. 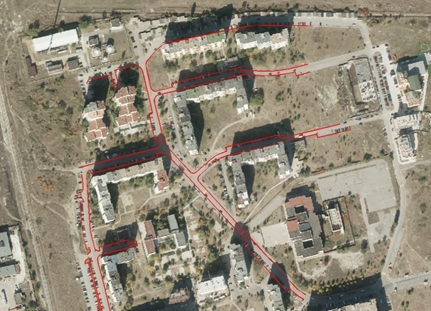 An extract from the underground cadastre plan of the city of Sofia is indicated in Fig. 18. As this plan contains information about the spatial positioning of the underground communications, it is completely possible that after its three-dimensional digitalization a complete three-dimensional model of the populated area with included underground infrastructure should be obtained. At the creation of a cadastre map, the photogrammetric method may be used as an auxiliary method, but the main database may be obtained solely with the traditional geodetic methods. The photogrammetric method is irreplaceable for the workmanship of specialized maps for spatial planning, for the needs of natural parks, for agriculture, maps of seaside areas and so on and it saves considerable spending of funds and time. A three-dimensional model of a populated area may be created making use of data obtained from a cadastre map and photogrammetry for a brief time at a comparatively low price and this model is sufficiently precise to find application in the management of the populated areas.